I hope everyone is doing fine and enjoying the sun for I am sure enjoying the hot sunny days. 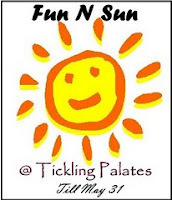 I have been so irregular in posting recipes in my blog and visiting all the recipes posted by my blogger friend's ... The holiday mood has gotten the better of me...ooooohhhh, lazy me..!!!! This my daughter's favourite one as she gets to eats it [not drink it], scooping each layer with her small spoon and relishing each mouthful. 1.Hull and clean the strawberries.Puree to a thick paste. 2.Peel, stone and chop the flesh of the mango. Puree to a thick paste. 3.Peel the kiwi and slice into thin slices. 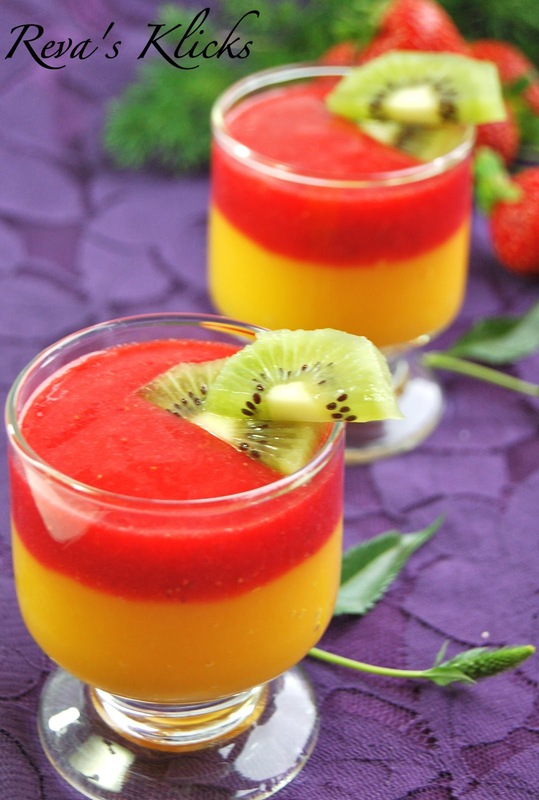 4.Fill the glass cups with the mango puree and top it off with strawberry puree. 5.Arrange the kiwi slices and serve immediately. Note:Chill the fruits before making the puree and serve chilled. Sprinkle a teaspoon of icing sugar on top if the strawberries are not sweet enough. Sending this to "Healing foods-Mango", an event by Siri and guest hosted by me. Also sending this to "Fun n Sun" happening at Tickling Palates, Seasonal Indulgence-Series Summer Coolers happening at Saffronstreaks, Healthy Recipe Hunt 3-Healthy Summer happening at Kurinji Kathambam. Wonderful and refreshing drink. Presentation is excellent. Colorful and refreshing drink, looks yummy... beautiful presentation. Nice to see u after long time I guess.. the clicks are marvellous and the drink and the color combo is cooooooool..love it totally. Loved all the colors in it...looks just tempting n amazing..
Lovely thick smoothie...and the colours are looking gorgeous. Smoothie looks good. I love the separate colors. Nice pictures. Wat a catchy,pleasant and great looking smoothie,definitely a fabulous drink..
What a colorful n yummy smoothie! Looks fantastic reva!!! Glad ur back!!! Perfect smoothie for summer, I liked your presentation. Smoothie looks so lovely and refreshing. 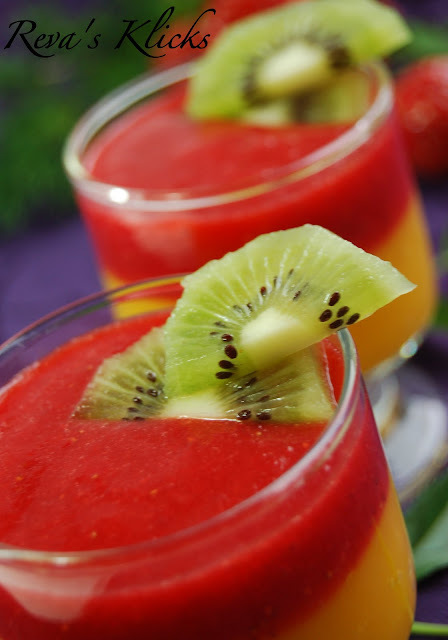 Wow..perfect smoothie..loved the combination..excellent clicks !! Wow wonderful idea to have two flavors in one glass.Looks so delicious and nice presentation. Wow!!! such a lovely drink and that too on a hot sunny day is really a thirst quencher. Loved the clicks a lot. Colourful picture and mouthwatering smoothie. 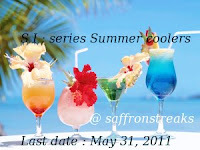 Wonderful and refreshing drink..lovely clicks..
Just drooling over that lovely presentation. Gorgeous n so romantic- loved the recipe n the pics both dear! thanks for visiting my blog and leaving ur comments .i really appreciate that.